Reload Connection: Connector Tables Can Now Be Reconfigured Easily. Documentation and SupportReleases Feijoa Release Notes 2018.02.17Reconfigure Connection: Connector Tables Can Now Be Reconfigured Easily. Things change. That's a fact of life and sometimes our data sources change too! We need to be able to change our Connector Tables any time the need arises. 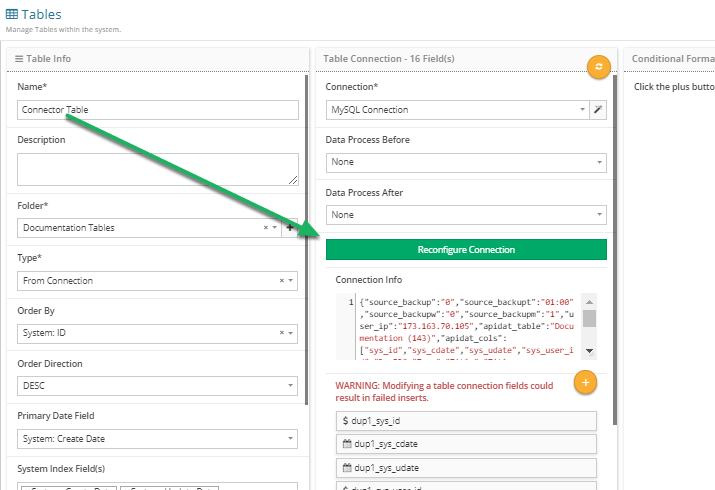 New in the Feijoa Release: Users can now choose to Reconfigure Connection, allowing them to step through the Connector Table setup process again. Changes can now be made much more easily than rebuilding the entire Table. 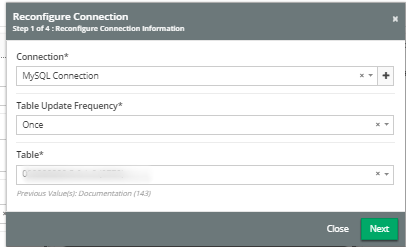 From within the File Tool, click the button labeled "Reconfigure Connection"
The "Reconfigure Connection" modal will open, allowing you to step through the process again. After you are finished making changes and save, the Table will be completely rebuilt using the new connection configuration.